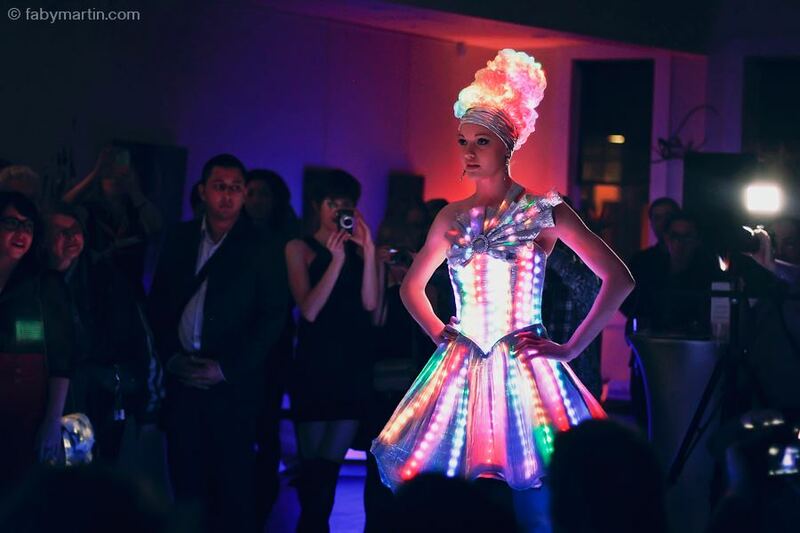 Whether for awe-inspiring high fashion, functional wearables, or costuming and cosplay: many DIY designers and makers are integrating LED lights into their garments. But for someone who is new to electronics, it can be confusing to know where to start. For the absolute beginner, here’s a primer demystifying using LED lighting for wearable tech. Don’t want to read? Watch my Intro to LEDs in video format. LED stands for “light emitting diode”. LEDs are perfect for wearables, since they’re small, inexpensive, and easy to work with once you know the basics. The most simple LEDs, and the best place for beginners to start, are two pin LEDs. These LEDs have two pins, or wires. The longer wire is the positive side, known as the anode, and the other is the negative, or the cathode. Currents in LEDs only go one direction, from the positive to the negative. This is important to remember when working with LEDs, since LEDs with wires in the wrong direction won’t work. 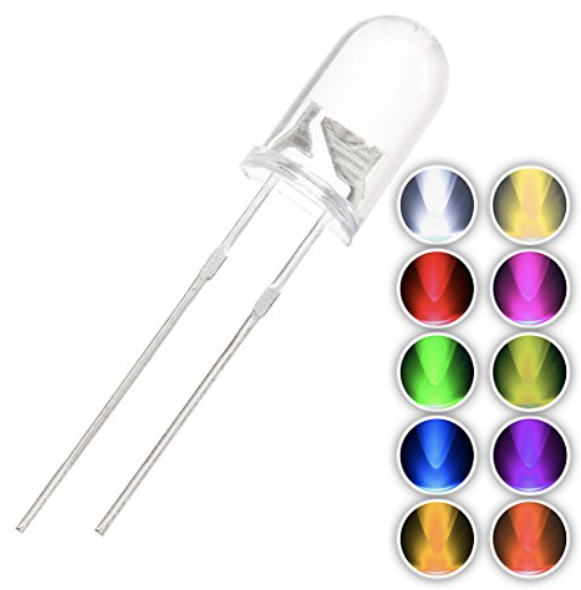 Two pin LEDs come in a variety of sizes and colors. They are relatively inexpensive to purchase, and therefore a great starting point for beginners. This is my favorite LED set and I’ve purchased it multiple times. It comes with white, blue, red, and green LEDs in two sizes. The box is also nice to re-use for odds and ends. Find it here. 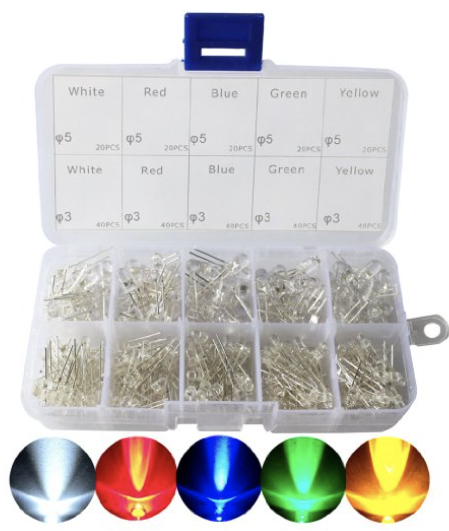 This is also an inexpensive set of 100 LEDs in 10 colors, including harder-to-find colors like pink and orange. You don’t get the cute box though. Get it here. Some LEDs have more than two pins. These are multicolored RGB LEDs, or addressable LEDs. 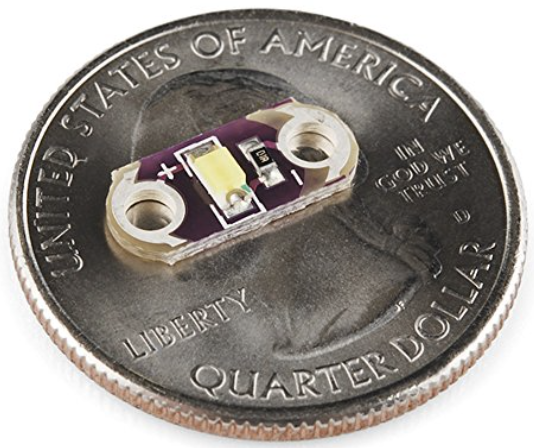 These LEDs can be controlled for a variety of functions, including lighting up and changing colors in a pattern or sequence written in code, or responding to sensors. RGB (red green blue) LEDs have three pins powering the red, green, and blue elements The fourth pin is a return pin. Addressable LEDs have a “data in” pin, a “data out” pin, a ground pin, and a power pin. Both of these LEDs gather data from a signal that determines the brightness and color of the LED. Most MakeFashion projects use addressable LEDs. If you’re just learning to work with electronics, I’d recommend learning with basic two-pin LEDs before moving to the more advanced ones. LED strips can also be used in wearables. These are convenient to work with since they are already wired together and can be cut into the length you need for your project. The lights on analog LED strips all act as one, and digital strips allow each LED to be addressed individually. In wearables, use these when you want the effect of a strip or grid of dense lighting. 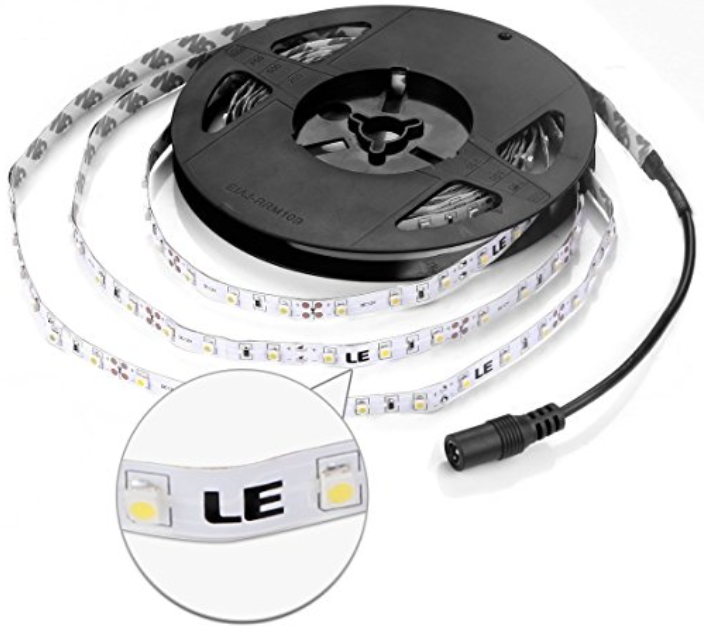 LED strips are popular for home lighting projects, so are easy to find. This one has self-adhesive tape which is handy if you’re attaching it to fabric (you’ll still want to use glue). White LED strip. 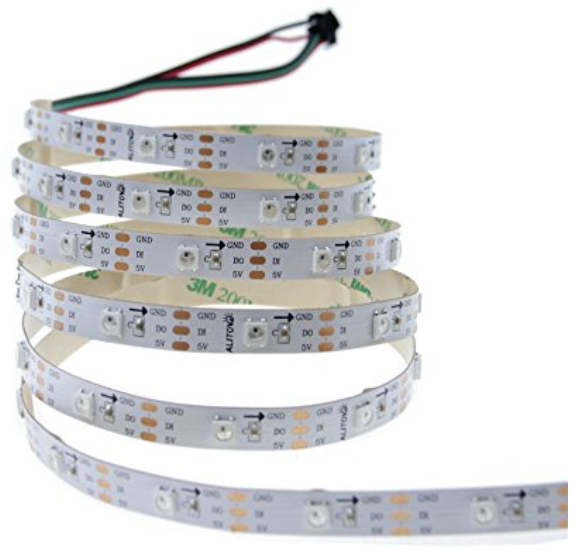 Addressable LED strips have also become easy to find. In addition to wearables, they are fun to use for app or voice-activated home projects. Addressable LED strip. As DIY wearable tech have increased in popularity, there are a number of LEDs and microcontrollers designed specifically for sewing. The Adafruit Sequin and LilyPad LEDs are both designed to be small, lightweight, and with small holes for thread. 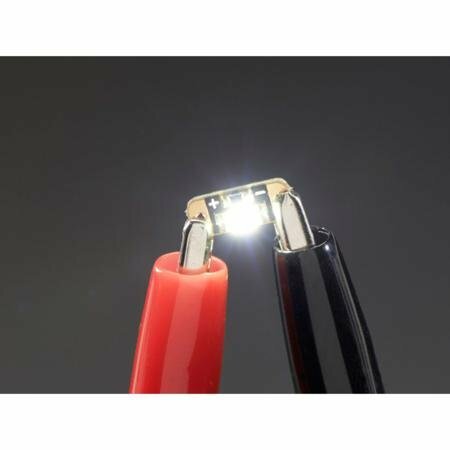 While these can be slightly more expensive than standard LEDs, they can be a great starting point for beginners and projects where you intend to have the LEDs visible on the surface. Adafruit sequins are small and easily stitched. They are perfect for making soft circuits, and look great on wearables. White Adafruit sequin. This is a mixed color pack of the Lilypad sequin LEDs, compatible with LilyPad and Arduino. Get them here. 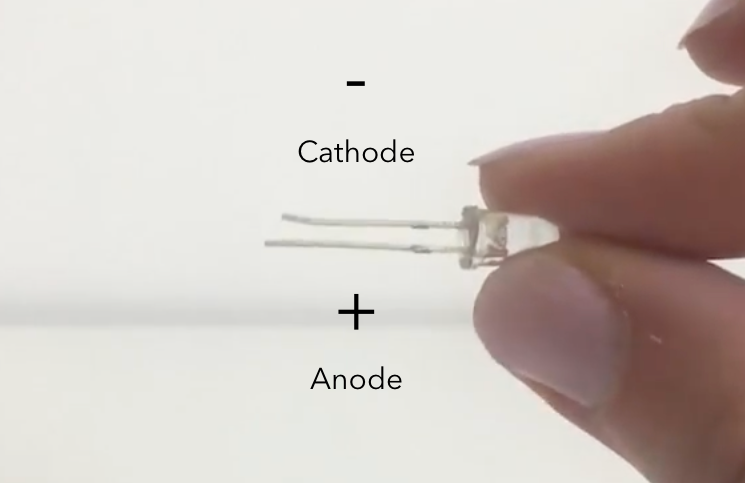 Learn how to make a standard two-prong LED sewable for wearable tech.